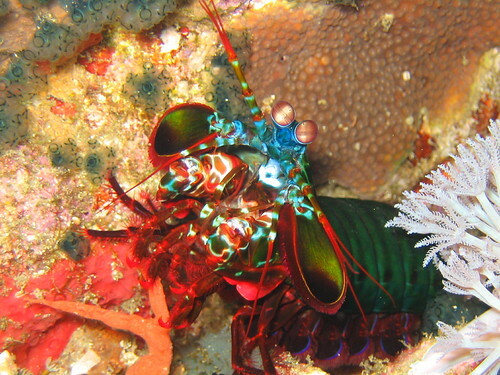 My brother took this with a Canon Powershot A70 on our diving trip to Verde Island in December 2004. It’s a mantis shrimp, or a stomatopod. Here’s what stomatopods look like in their larval stage. More just-uploaded photos of Christmas 2004 to New Year 2005: JFK-DXB-MNL, Christmas in Manila 2004, Virra Mall (pre-renovation), Verde Island, and Verde Island Diving.